If you want to make any adjustment to your photo before printing or sharing them, the Adjustments panel in Photo Editor will help you to get the work done. 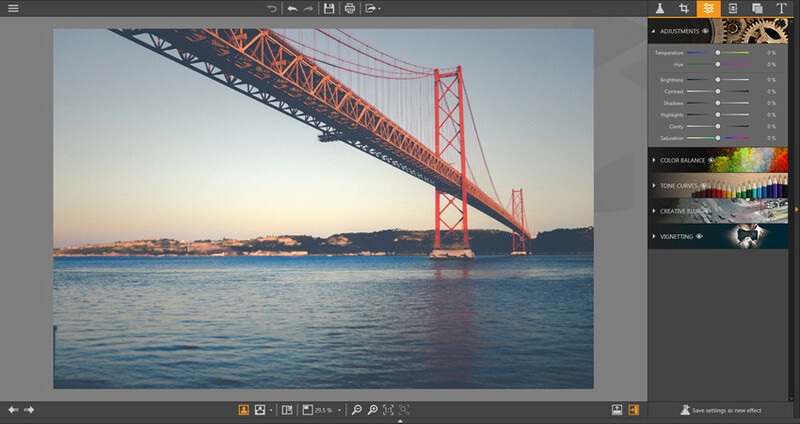 Start Photo Editor and add your photo to the program window, then you’ll see the panels at the right side. Click the Adjustments icon to enter the Adjustments Panel. There’re 4 categories in Adjustments panel, including ADJUSTMENTS, COLOR BALANCE, TONE CURVES, CREATIVE BLUR, and VIGNETTING. ADJUSTMENTS: Drag the sliders to make adjustments to your photo. COLOR BALANCE: The program provides a color balance solution, and it gives 3 color balance modes, including Global, Split Toning, and Three-Way. Global: Make a general color balance on your photo. Split Toning: You are able to adjust both shadows and highlights of your photo with this option. Three-Way: You have even more options to adjust the colors of your photo. Tone Curves: With the help of Tone Curves option, you’ll be able to adjust the tone of your photo, and make it better for your any purpose. 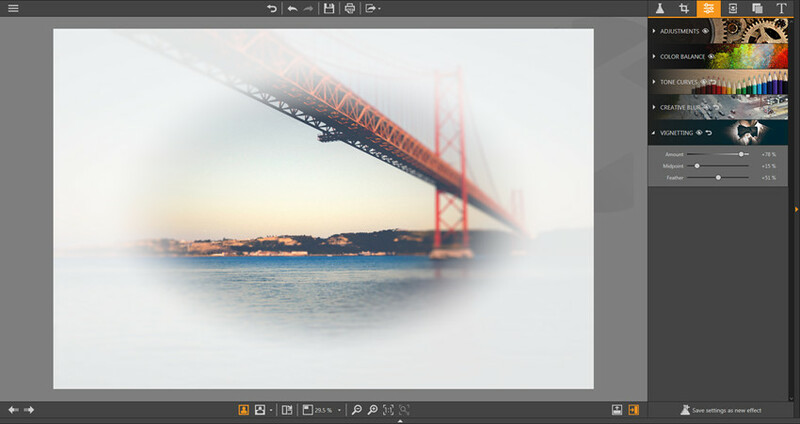 Creative Blur: You can use the Creative Blur tool to blur photo background, or focus on the specific part of your photo. It offers two blur options: Linear Blur and Radial Blur. Linear Blur: Make a linear sharp area, and blur other parts of the picture. You can move or redefine the size of the area. Radial Blur: You can create a circular sharp area in your photo, and blur other area of the photo. You’re also allowed to adjust the area and the size of the area you want to focus. Feather: Use this option to adjust the width of the gradient between the focus and the blurred area of the photo. Amounts: Take advantage of this option to make the blurry area less or more fuzzy than the original settings. Vignetting: With the help of this tool, you are able to edit the corners of the photo. There’re three sliders available in the Vignetting category, including Amount, Midpoint, and Feather. After adjusting the corresponding sliders, you’ll get the blurry corners.